Have you ever bought an item of clothing, thrown it on in the changing room and decided it looked good, or scooped it up as an impulse buy, only to get it home and realise there is something about the fit that makes it almost unwearable? With high street shops under pressure to bring out new 'micro-collections' every couple of weeks, it's not surprising some garments slip through the cracks (these are usually the ones you'll see en masse on a sale rail) but it is frustrating when there is something you really like about the piece of clothing you've just bought. My sister snagged two of these maxi dresses, one for each of us in slightly different colours, at a sample sale. I loved the printed silk and was sure it would be great to wear on holidays, but soon realised while wearing it around the house on a hot day that although there was plenty of fabric gathered into the waistband of the skirt, the bottom was so narrow that I couldn't walk normally! At first I wondered whether the skirt had somehow ended up upside down during the manufacturing process, but it had pockets in the side seams, so the narrow skirt was either deliberate, or no-one had tried walking about in it during a fitting. The simple solution would have been to make a slit in one of the side seams (or take it to a charity shop!) but I was feeling adventurous; I really liked the fabric and the print, the top was super cute and it had pockets, so out of curiosity I unpicked the waist seam and laid a simple pyjama trouser block onto the skirt to see if I would have enough fabric to make the dress into a jumpsuit. There was just enough, so using the existing side seams with the pockets as outside leg seams I cut two 'legs' from the skirt, adding an extra couple of inches above the waist so I would be able to move about! After sewing up the legs to make a pair of loose trousers, I re-attached the waist of the trousers to the top and added shoulder straps made from the leftover fabric. Although it ended up being quite a different garment, I've got a fab summery outfit to wear on holidays or for lounging around, and not only is it comfortable to move around in, but it has pockets! This sort of 'refashioning' project may seem daunting but it's a worthwhile thing to learn; being able to see the potential in a garment and making some alterations so that it's something you love wearing rather than something you tolerate is such a useful skill. A few hours spent learning how to use a sewing machine and making a simple garment from scratch should give you the confidence to fix the clothes in your wardrobe that are bothering you. If you're not sure about giving it a go unsupervised, try beginners sewing classes at somewhere like The Thrifty Stitcher , where sewing pro Claire-Louise Hardie also runs alterations workshops and troubleshooting sessions for personal projects. 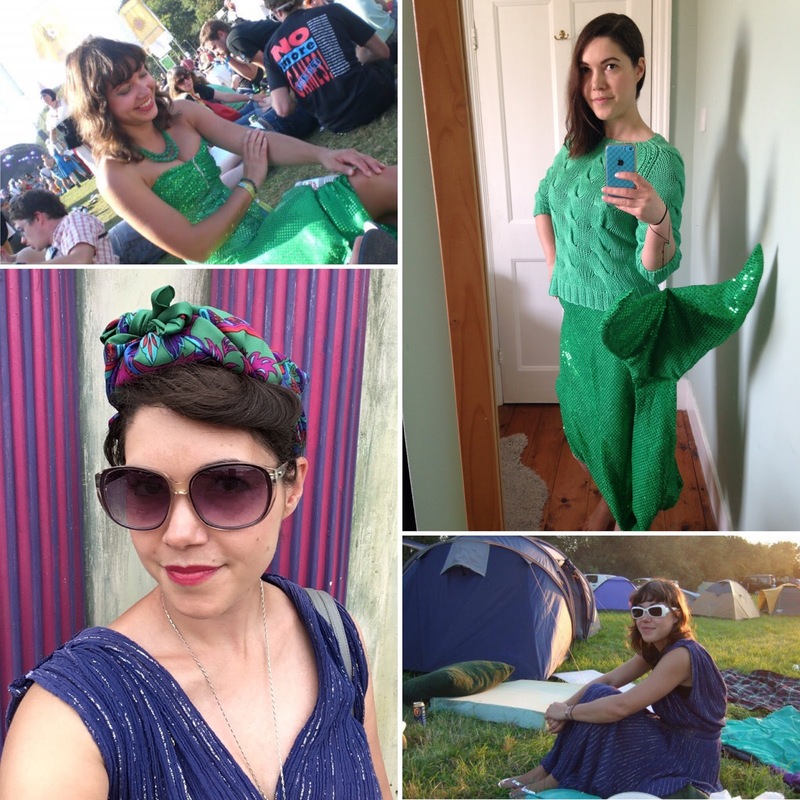 I still have the second dress languishing in my wardrobe and I’m planning another refashioning project so it will be ready for next summer: watch this space! Last Thursday, the 17th August, I went to Chelsea Physic Garden for their 'Twine @ Twilight' event, celebrating our relationship with textiles from the natural world. It was a beautiful warm evening, and after picking up my complimentary cocktail I wandered through the gardens, enjoying the exuberance of a carefully planted garden in high summer. The borders were such an artistic combination of colours and textures, so I loved finding a textile installation that mirrored this: Dr Jane Scott's textile sculpture suspended over one of the paths like part of the canopy of trees. The Weaves and Leaves exhibition took the form of laundry day in the History Garden: swatches or sheets of fabric (alongside the the occasional vest and pair of socks) were pegged out near the plant they were produced from. It was a visually pleasing and tactile illustration of the versatility of these plants, comparing the varieties of cloth that can be woven from bamboo, cotton and hemp. The notice boards in the garden explained the history of our relationship to these plants, emphasising how reliant we have always been on the natural world for clothes and textiles, but also pointing out the ways in which the industrial farming of plants such as cotton has negatively impacted people and the planet. From the start of the Industrial Revolution, where businessmen in the UK profited from cotton picked by slaves in the US, to the harmful impact that modern industrial cotton farming, which relies heavily on pesticides, has had on farmers, their local communities and the environment. The exhibit invited us to ponder the future of the natural textile industry, and consider which plants could yield the greatest benefit for workers, consumers and the natural world. Sustainable fabric supplier Offset Warehouse were hosting a brooch making workshop, so feeling inspired by their selection of ethically produced silks and jerseys (if anyone you know is still convinced that sustainable fabrics aren't fashion-forward, a quick glance at Offset Warehouse's website is guaranteed change their minds! ), the gardens outside, and their helpful set of embroidery instructions, I rustled up a brooch to go with my outfit! It was a relaxing way to spend half an hour, even if I did have to rush off at the end to get to Kate Poland’s talk: “Spinsters, Hecklers and Lingerie”, about the history of linen. Attendees at the talk were given bingo cards, to help us spot words which have their origins in the growing of flax and the production of linen, which dates back thousands of years, and is the earliest known woven textile. As well as wonderful words I had never heard before, like "scutching" (the removal of the 'straw' that surrounds the soft fibres in the flax stems), I also discovered the origins of more recognisable words. The Romans used linen for garments worn under thicker outer clothes when in colder parts of Northern Europe, giving us the word "lingerie", “heckling” referred to the combing of flax fibres ready for spinning, and "spinster" originally referred to a woman who could make her own living, usually through the spinning of flax into linen (time to reclaim that word, I think!). Linen has been such a widely used fabric because it has desirable properties; flax is easy and quick to grow in temperate climates (only 90 days from sowing to harvesting), and linen as a fabric can be spun and woven into different weights of cloth, and is moisture-wicking and moth-resistant. Because some types of woven linen could be difficult to maintain, requiring careful storage and ironing to avoid creases, it declined in popularity during the 20th century as easy-care man-made fabrics became popular. In 2014 The Flax Project took on a challenge to produce a linen garment from scratch within London; growing flax at community farms and allotments, and encouraging the involvement of groups of children from local schools, it took a year and involved almost 500 people! The resulting hand-knitted garment gives an interesting insight into the complicated process involved in making our clothes that we rarely think about, and is a true example of slow fashion. The European Consortium of Hemp and Linen were also on hand with a swatch book demonstrating the resurgence of linen as the fabric we all need in our modern wardrobes; knitted as a jersey it is soft with a good drape but not too stretchy, and it can also be woven or felted to create smart suiting fabrics. The samples banished bad memories of crumpled summer trousers; linen has re-emerged as a fabric I would be keen to work with again. Another fabric I am newly fascinated by is Pinatex, a leather substitute made from pineapple fibre. The fibres come from the plant rather than the fruit itself, and the non-woven unfinished fabric feels rather like a thick felted wool, or a millinery 'hood' before it is blocked into a hat. After the fabric is treated it is usually used for accessories or footwear, like my fab Po-Zu shoes! Pinatex feels really light so it's great for summer shoes, but it's also flexible so it wears well. The range of natural, bold colour or metallic finishes means it looks like a fabric of the future and should appeal to even the most hi-tech fashion lovers. There were also cyanotype printing workshops with Zoe Burt and flower-crown making workshops with Pip Bensley Flowers that I sadly didn't have time to attend, but looking at examples of people's handiwork as they walked around the gardens, these artists were also doing an excellent job of emphasising the beauty of the natural world, and how it can inspire and delight us. I thought this was a great event; part history lesson, part peek into the future, encouraging a celebration of the beauty around us while gently pointing out the ways we can make the world more beautiful through thoughtful actions. I’m trying to make the most of my wardrobe, re-using or upcycling the things I’m not making the most of, so I thought I’d share the results on my blog over the next few months, starting with some last-minute accessories for my weekend as bridesmaid at my sister’s beautiful wedding! Having spent a fair percentage of my free time in the first six months of 2017 making a wedding dress for my sister, I hadn't put a lot of thought into what I was going to wear for her two wedding days (one at a registry office in Lewes, the other at an idyllic-looking farm, complete with wildflower meadows and woodland glade) in East Sussex. I ended up being a proud outfit repeater at both events, wearing a Whistles dress I had originally bought for a friend's wedding in 2011 to the registry office, and walking my sister down the aisle and into the woods in a re-worked dress I had made and worn to another friend's wedding in 2015. Since there was no guest overlap (apart from me!) from the other weddings, and I'd just been a guest so there weren't a whole heap of formal portraits documenting my appearance, I felt justified in wearing both dresses again, particularly as I had worked especially hard on the handmade dress when I first made it. Fortuitously, it also fitted perfectly with the colour scheme of the wedding party, and there was some sentimental significance to one of the fabrics I had used; a piece of eau-de-nil beaded chiffon that I had saved after using most of it to make a dress for my sister for her Sixth Form Leavers Ball, over a decade ago. I'm a real hoarder of fabrics and haberdashery, even bits and pieces that don't have sentimental value, and since I'm trying to downsize and lead a slightly less clutter-filled existence, my first port of call had to be the pile of pretty things I'd bought that were just waiting for the right occasion, and the pile of rarely-worn clothes and accessories that aren't looking their best and could do with some creative repair. I bought these velvet leaves from Brixton vintage treasure trove Leftovers several years ago, but had never really decided what to do with them. Since no good wedding is complete without a hat, or at least a fancy fascinator, I decided to use the leaves to make a mini version of a 1940s 'calot' hat; a brimless hat that sits on the back of the head. It would sit between my mini undercut and my pinned-up hair, hopefully hiding the messy bits of my 'do! I used several layers of cotton bobbinet (offcuts from a layer of my sister's wedding dress skirt) to create the base, tacked together then pasted with a mix of PVA glue and water and pinned to a polystyrene head to dry! I sewed each leaf on individually, then used some felt as a lining. The final touch was to add some small thread loops on the inside so I could pin it securely to my head. Although I was worried that I might have needed a hat pin as well, the bobby pins worked their magic and the hat stayed firmly in place, even on a day so windy that I arrived at the venue in an old-fashioned headscarf arrangement so my hair wouldn't get ruined! One of my bridesmaid duties was to look after my sister's possessions so she wouldn't need a bag, so I needed a decent handbag that could hold two lots of make-up, an umbrella, sunglasses, phones and the notebook I'd written my maid of honour speech in! I had a white chainmail handbag that I'd bought in a thrift store in Wellington, New Zealand, but it was looking a little worse for wear as several of the links had come loose. I also happened to have a large collection of beads and broken jewellery, so I started off embellishing the bag with a couple of broken brooches. The first brooch I added, a cluster of diamanté and pearls, worked so well that I abandoned the other brooches and used pearls from some broken necklaces to adorn the rest of the bag. The abstract design was informed by the missing chainmail links and the number of beads available, but I was really pleased with the final result; this bag will be coming with me to any fancy functions I attend in the future! 'Balenciaga: Shaping Fashion' and 'The World Of Anna Sui': can couture cure us of our fixation with fast fashion? Lots of fashion writers have predicted the death of couture, as pressure grows on designers to produce more and more collections per year, trends appear on the high street within weeks of catwalk shows at a fraction of the price, and, if you are a public figure, being seen in an outfit more than once will be remarked on at the very least, if not ridiculed. The popularity of couture as an exhibition subject, however, seems to go from strength to strength. I visited Balenciaga: Shaping Fashion at the V&A and The World Of Anna Sui at the Fashion and Textile Museum, and although neither exhibition tops the superstar status of the Alexander McQueen retrospective (when the V&A stayed open through the night to meet demand for tickets in the final few days), the popularity of fashion exhibitions suggests we haven't completed the transition from seeing fashion as valuable to seeing it as disposable. Both exhibitions illustrate something important about couture that we need to embrace again in order to create a more sustainable fashion industry. The World of Anna Sui showcases a designer with boundless enthusiasm for fashion; someone who is constantly intrigued and inspired by the world around her and has pursued her dream of being a fashion designer from early childhood. Her maximalist creations, a mash-up of pop culture references, bold colours and striking fabrics, are the stuff of my teenage dreams, but her painstaking research into fashion history and her beautifully constructed takes on vintage styles held a particular appeal for my inner costume geek. I was swooning over her 40s tea dresses, which feature Christian Berard prints on jewel-coloured silks and fondly reminiscing about my attempts to recreate her 'pastel grunge' looks with retro finds from Brighton's thrift shops in the mid 90s. Her brand is centred around looks that are eye-catching and unique, optimistic and playful. Fashion is presented as something exciting, the clash of prints and textures showing a disregard for traditional 'rules' of dressing that echoes the rebelliousness of the subcultures that Sui references in her designs. There is much more regard for tradition at the V&A's Balenciaga exhibition, which is a celebration of the craft of couture, and of Balenciaga as a master cutter and fitter as much as a designer. The exhibition emphasises the importance of the choice of fabric in determining the drape and hang of a garment, and showcases the virtuoso pattern cutting which is central to the deceptively simple shapes of Balenciaga's outerwear. X-rays, reconstructions of garments in toile form and even a dress displayed on a mannequin inside out reveal the intricate inner structure of evening gowns, the boning and underpinnings necessary to create the perfect silhouette. I was impressed by the proliferation of pockets, even in an elaborate evening cape, and reflected on it over on my Twitter account, where the lack of decent pockets in women's clothing is lamented and ridiculed on a regular basis. As well as the garments themselves, there were also films showing the process of creating couture: mesmerising clips of the craftspeople at Lesage embellishing fabric with embroidery and sequins, as well as a short documentary showing the stages of cutting, fitting and finishing a made-to-measure jacket. As a dressmaker myself, I always appreciate being given an opportunity to see my fellow makers in the spotlight, as I hope it reminds people of the human labour that goes into the production of clothes. We are all garment workers, in the end, it's just that some of us have been fortunate enough to be given the time and opportunity to develop and perfect our craft, to have our work appreciated and to earn a decent salary. Obviously couture is elitist, and outfitting ourselves in made-to-measure luxury for everyday life isn’t a practical option, but even clothes that highlight wealth inequality can be viewed as part of a more complex story about the wider fashion industry. Today, the industry’s biggest problems are exploitation, both of people and the environment, through overproduction and overconsumption. People struggling to make ends meet are not going to be overconsuming, but those of us who can afford to splash out on a new outfit when the fancy takes us need to think about what we really value about fashion, and act accordingly. I spent hours at the two exhibitions (and the cost of at least one fast fashion outfit on tickets), and I was delighted by the creativity and craftsmanship I saw, and it reaffirmed that I want my own wardrobe to look like this, as much as possible, rather than the bland and uninspiring fast fashion that has turned me off high street shopping. There is a possibility that the tide could be turning; earlier this year Stylist Magazine published this article about mental health and burn-out in the upper echelons of the fashion industry. Several designers, including Jean Paul Gaultier, now only produce couture, having found that the pressure to produce an ever-increasing number of collections sapped them of energy and inspiration. For those of us who need more affordable fashion options, many small ethical and sustainable clothing brands have also rejected the high street's emphasis on constantly changing stock, opting instead to sell multi-seasonal pieces that will be versatile enough for even the most carefully curated of capsule wardrobes. The ongoing popularity of good quality vintage clothes also suggest that people are nostalgic for more than cute floral prints, they also still value flattering fit and appreciate clothing that is made to last. These two exhibitions are a must for fashion fans, but it might be worth taking along a friend who can't understand what the fuss is about. Being encouraged to see fashion as an art form might prompt more thoughtful shopping habits, or a new respect for the people who make our clothes, and this has got to be a good thing. Festival fashion: find the weekend's worth of amazing outfits lurking in your wardrobe! If you’re a festival-goer in the UK, you know the drill: it’s either going to be rainy and muddy or hot and dusty (or if you’re really lucky, both! ), your clothes are going to be crammed into a rucksack and thrown around a tent in the dark, you’ve got limited access to mirrors but everyone’s going to be taking loads of photos. I love dressing up for festivals, but I’m sceptical of what’s often advertised as festival fashion on the high street (the combination of playsuit and portaloo is a no-go for me, I’m afraid), so I always see festivals as a chance to give some of my unloved clothes their day in the sun rather than investing in a new selection of impractical outfits. There’s a reason why stylish-but-practical jackets, denim cut offs, wellies and chunky socks will always be festival staples; you’re ready for everything the weather might throw at you, and as my sister is proving here, you’re always camera-ready even when you are holding a broken long-drop door for a pal! Festivals are a time to escape from day-to-day life and immerse yourself in the atmosphere that the organisers have created. There are no dress codes, so you can proudly wear clothes that might be hiding in your wardrobe because you feel they are too short, too low cut, too revealing for every day. I used to wear this dress a lot, then got a bit body-conscious, but I felt it was perfect to wear at Latitude to watch Sh*t Theatre’s show about Dolly Parton! Whether the festival you are attending has a theme or not, we all have clothes we’ve bought for fancy dress parties that we can re-purpose as perfect festival wear. My sister had a white lace mini dress from a 60s theme party that we persuaded her to wear for the day as the bride-to-be for her festival-based hen do, and the high-street rucksack ended up being more than a novelty festival purchase, she's now a backpack aficionado! While each year has its festival-fashion cliche, and there will be no shortage of stalls selling those things if you want them, vintage stalls and pop-up charity shops offer festival bargains that you’ll still want to wear long after you’ve finally stopped finding glitter everywhere. A couple of years ago I found a red pleated maxi-skirt in a pop-up vintage shop at Folk by the Oak which has become a wardrobe staple, and this year the Oxfam shop at Latitude had a fantastic selection of clothes, including a brand new Ted Baker coatigan which kept me cosy at the festival and will slot perfectly into my work wardrobe. We all have clothes we’ve bought for a certain event and haven’t been sure how to incorporate into our day-to-day wardrobes, or old clothes which are comfy but not eye-catching, so why not try mixing and matching some of these to create fabulous festival outfits? Christmas party tops paired with faded shorts, or a vintage dress worn with an old hoodie, beach-holiday sundresses with a cardi and leggings for a chilly evening, you’re bound to find something that suits the festival and your style. Respect the festival site, respect your clothes, take them home with you!